In previous post, we compare the performance of different types of the models applied to the same data set. In reality, a more frequently encountered issue is to compare the performance of credit bureau scores and custom model scores. By custom model scores, we mean the model that is built based on client's own historical data. I have done numerous predictive modeling projects in the area across industries. My conclusion is that custom model scores are almost always better than generic credit bureau scores by large margins. The following gain charts are from a real project. For example, if we reject worst 20% customers based on their bureau scores, we can stop 26% of the loan default. 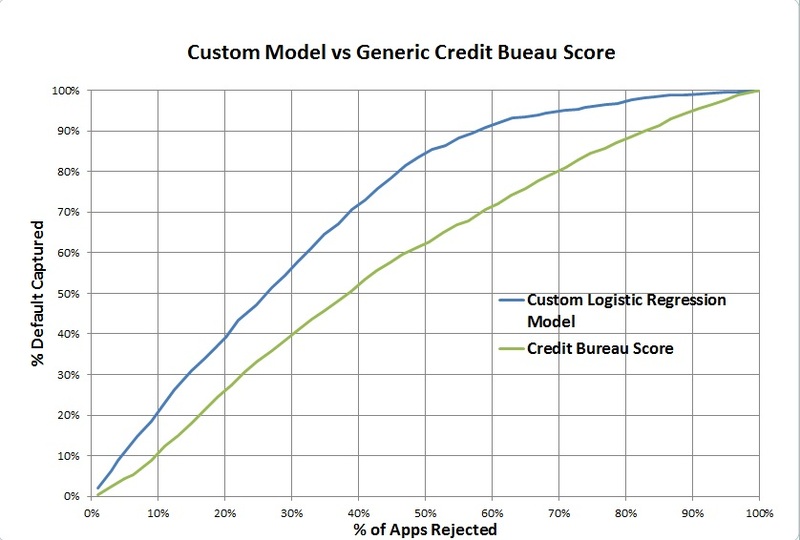 If we reject 20% customers based on custom model scores, almost 40% of the loan default can be stopped. The can easily translate into big savings for a company with large number of customers. The patterns are common. 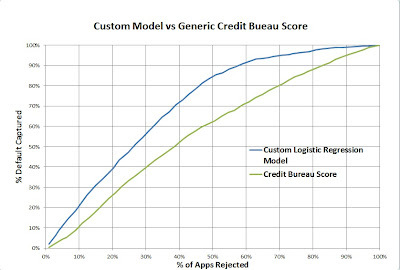 Thus, it is worthwhile to build a custom model that will almost always outperform generic credit bureau scores as long as the client has enough historical data.